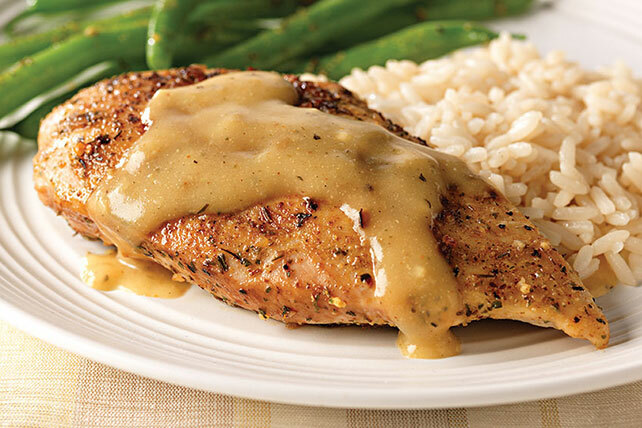 Enjoy the garlic and herb dry rub in our Chicken in White Wine Sauce recipe. Our Chicken in White Wine Sauce is then completed with an incredible sauce. Rub chicken with 2 Tbsp. dry rub. Heat oil in large skillet on medium-high heat. Add chicken; cook 6 to 8 min. on each side or until browned on both sides. Remove chicken from skillet, reserving drippings in skillet; cover chicken to keep warm. Add remaining dry rub, chicken broth, wine and mustard to drippings in skillet; stir until blended. Bring to boil. Whisk cornstarch and cream until blended. Add to broth mixture; cook and stir 5 min. or until thickened. Return chicken to skillet; spoon sauce over chicken. Cook 2 to 3 min. or until chicken is done (165°F). An instant-read food thermometer measures the temperature of a food in about 15 to 20 sec. It is not designed to remain in the food while it is cooking, but should be used near the end of the cooking time. For accurate temperature measurement, the probe of the thermometer should be inserted 2 to 2-1/2 inches deep into the thickest part of the food. If measuring the temperature of a thin food, such as a ground beef patty or boneless chicken breast, the probe should be inserted through the side of the food. Substitute apple juice for the white wine.